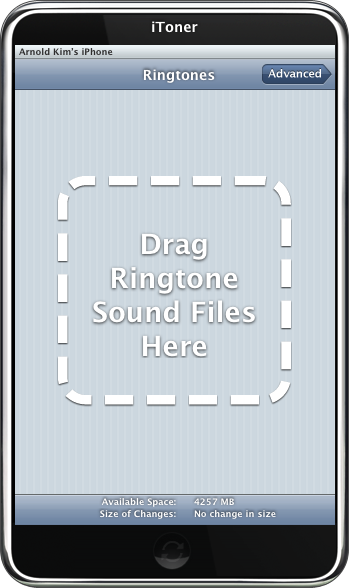 Mac software developer Ambrosia is poised to release their own iPhone Ringtone tool for the Mac (Intel and PPC). The shareware tool is called "iToner" and will allow you to easily sync audio files (MP3, AAC) to your iPhone for use as custom ringtones. The shareware application is wrapping up beta testing and I've been able to test out a copy and it works quite well.You simply drag your audio files into the window and hit the "Sync" button on iToner and you're done. No resetting of the iPhone necessary. "Advanced Settings" brings up a list of your iTunes playlists and lets you sync an playlist at once. From the iPhone, the synced files appear on your ringtone list in both Contacts and Settings. One thing to note is that the first version lacks a cropping/clipping tool, but I have heard that clipping and other advanced features will be coming in future versions of iToner. Meanwhile, for the hacking-averse amongst us, Ambrosia tells us that they are installing ringtones "the proper way, without any hacks" and assures us that this should not affect future iPhone updates. iToner should be available at Ambrosia's site within the next week.